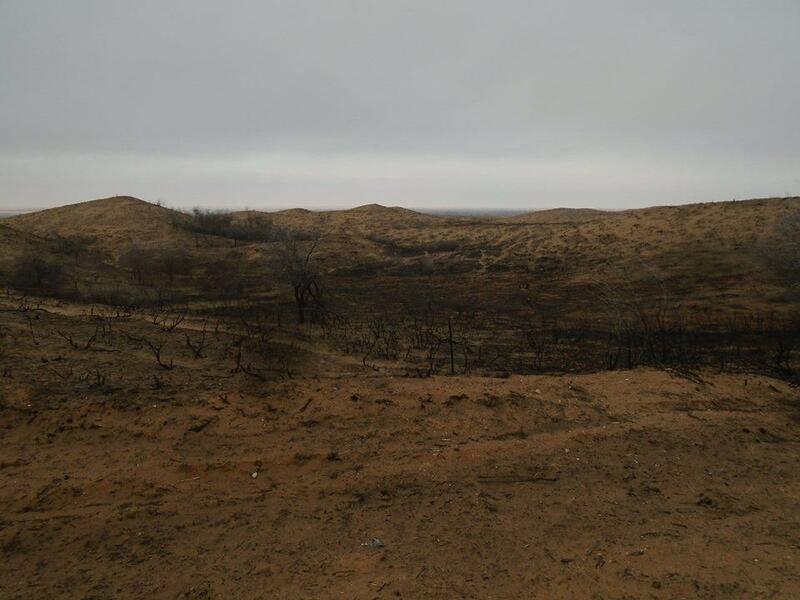 A burned field in northwestern Oklahoma. Meteorologist Gary England talks to KGOU's Jacob McCleland. University of Oklahoma consulting meteorologist-in-residence Gary England says the worst of the fire season is probably behind us, at least in northwestern Oklahoma. England says large range fires usually occur in late winter, winter and early spring when vegetation is dormant and everything is dry. The northwestern Oklahoma fire occurred during perfect conditions for a wildfire - it was windy, the weather was dry and plants were brown. “The problem is it became so large, there were so many hotspots, so it would calm down a little bit at night, and come back the next morning. The wind would increase and those little embers would start blowing again,” England said. Even though the worst is probably behind us, England says there’s a chance another fire outbreak before the wildfire season comes to a close. Jacob McCleland: Now Gary, we had that enormous northwestern Oklahoma wildfire earlier this month. What made the conditions ripe for this type of a magnitude of a fire? Gary England: The big fires, the range fires like that, usually come about in the late fall, the winter and the early spring when the vegetation is dormant. So everything is dry. It also, when you get into drought and everything turns brown, which does happen, you can have those huge fires. But the one in northwest Oklahoma, you know, it was extremely dry. They had been low on rainfall, so it’s a mix of the drought, the dormant plants, and then the wind. And it just got started. And you can’t stop them. And the wind, I guess at time, on some of the days was up to about 45 miles per hour. Other days it was less. But the problem is it became so large, there were so many hotspots, so it would calm down a little bit at night, and come back the next morning. The wind would increase and those little embers would start blowing again. But it was primarily, to answer your question specifically, it was the dry plants, the dry conditions, and the wind. McCleland: Last year there actually was quite a bit of rain. Did that help produce more grass that in turn was just more fuel for the fire? England: You know, I remember one year we got close to 60 inches of rain here in Oklahoma City, man. Everything was lush and green over huge part of the city, er, or the state. Man, trees, the old trees were even growing. It was great stuff. Then I got to thinking about that, if this gets through the summer and get into the fall and they turns brown. Yeah, that was a problem when you have a lot of rainfall, a lot of growth, you have more things to burn. McCleland: This past winter was quite mild. Does that really have any effect on wildfires at all? England: If it’s a mild winter, sometimes you get rain and snow with a mild winter, sometimes you don’t. So it probably didn’t impact it that much. That’s my personal opinion. That’s not a scientific analysis. McCleland: Looking at the longer-term forecast for this spring, do you expect that we’ll continue to have an active wildfire season? England: Yeah, I think so. We have system coming toward us, and it will be rolling through in a few days and it looks like strong southwest winds and maybe a chance for thunderstorms right before that. And so that would help points from, say, Oklahoma City east. But the west, you know, if a fire gets started there’s going to be strong southwest winds 20 to 40 hour winds and they could get it again. Long answer to your question. McCleland: But it looks like the worst of the wildfire season may not be behind us yet? England: That’s a possibility, but in northwest Oklahoma it’s probably over now. You know, and in Kansas. It burned a huge area. But the other areas they just take off and, yeah, a big one could flare up no telling where. It’s just really crazy. And people are still throwing cigarettes out the window. McCleland: How has technology changed over the decades to help create the red flag warnings, for instance, to alert people that the condition could be favorable for wildfires today. England: Well, a lot of good people have been doing some good work, and part of it started with Dr. Crawford years ago - the Mesonet. You know, 110 weather stations. Those hi-tech things out there. Those hi-tech instruments, they measure the soil moisture, besides temperature and wind and all those things and rainfall, it measures the moisture in the soil and the temperature of the soil at certain depths. And from that they’ve developed certain programs, say, we have these conditions, did we have fires? Yes we did. What stage was the vegetation in? They’ve worked out some very great computer programs, to give them a really good lead on what’s going to happen. But then, a fire can just suddenly pop up anywhere. But, the tech, the hi-tech stuff came, the great programming and Norman, OU, they’re right in the middle of that, man. They’ve done a great job. McCleland: We’ve been talking today with Gary England. Gary, thank you so much. It’s been a pleasure talking with you. England: Man, it’s been a pleasure for me Jacob. Thank you, babe. Tornado season is upon us. 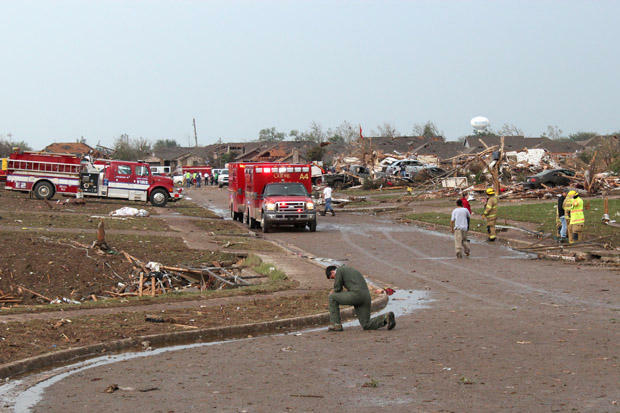 Oklahoma saw powerful storms last week, and state and local emergency management leaders continue to grapple with questions about preparation. What else can local governments and the state do to improve public safety? Are there new ways to fund private, school or community shelters? What can individuals do beyond the obvious to protect themselves, and what does the research show?